Some U.S. cities and towns still don't use water meters. Instead, the overall cost of delivering water and sewer services is tallied every month and divided by the number of customers. A homeowner may be using half the amount of water as his neighbor, but each pays the same flat monthly rate. Arizona's desert cities have long understood the need to measure the water used by homeowners and businesses. In the 1930s, the City of Tempe started to install meters to measure how much water its customers used. Tucson began installing meters in 1923. Most recently, many Phoenix Metropolitan Area cities have installed - or are on their way to installing - more sophisticated electronic meter reading systems. These systems allow city meter readers to remain in their cars and read individual water meters as they drive by a house. The systems reduce costs, improve accuracy, and provide the cities with better data. In the City of Avondale all water meters are read electronically. In the City of Phoenix, 89 percent of meters have been converted to electronic reading and the city expects to reach 100 percent by 2017. Cities also dedicate time and money to ensure meters are in good working condition. For example, the City of Phoenix examines large commercial water meters annually and, when necessary, replaces or repairs them. Through this careful monitoring, the city’s water managers can anticipate replacing these commercial-sized meters every three to five years. Water managers estimate that residential meters need to be replaced every 14 years, but estimates are no longer good enough. In January, Phoenix began a program to gather better data by annually checking 1,200 residential meters for accuracy. The city expects to have the data it needs to begin a more precise replacement schedule by this time next year. There are three main reasons why AMWUA member cities spend time and money to install, regularly maintain, and upgrade their water meters. Revenue: City water departments are required to pay for themselves. Water managers must charge customers enough to cover their costs. Costs include buying water, treating it to drinking water standards, and delivering it to homes and businesses. Then the cities must collect the wastewater their customers generate and treat it to reuse for irrigation, generating power, or storage underground for the future. These responsibilities take a massive amount of infrastructure. 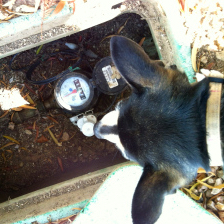 As meters age they can slow down and fail to capture 100 percent of the water used by a customer. That means not everyone is paying their fair share and that could eventually lead to financial losses and higher water rates. Planning: City water managers don’t like surprises. Arizona cities rely on meters to continually tally water used by every sector of the community - schools and parks, manufacturers and retailers, single family homes and apartment complexes - to help them manage water supplies and plan for the future. Water managers can determine now what new infrastructure projects they may need in the next decade and beyond, such as treatment plants or wells, and what standards are necessary, such as pipe sizes. Managers also can determine how much water supply they will need for growth and to protect against drought and shortages, and what conservation programs may need to expand. Conservation: When cities know how much water their customers use monthly, they can determine how much water they may be losing between treatment plants and delivery and, then, make repairs. Cities can lose water through leaking pipes, a main water line break, fire hydrants that aren’t tightly closed after use, or theft. Cities also can help their residential, commercial and business customers save water. Here are a few examples of conservation efforts that are possible when cities carefully measure customer water use. Tiered rate structure: A tiered rate structure means the less water a customer uses, the lower the price per gallon. This billing structure creates an incentive to save. Stop leaks: Many cities review water meter data to find month-to-month discrepancies in customers’ bills. That way they can alert customers to possible leaks or repair a broken meter before big losses add up. Target conservation programs: When cities know where the water goes they can create water conservation programs designed specifically for the needs of their community. For example, a city may focus on helping older HOAs with large turf areas to reduce water use. With meter data, cities can determine the highest water users and work with them to develop strategies and track progress. Measure conservation impact: Cities track and review water use data to evaluate and improve their conservation programs and to measure progress over time. Customers also can track their personal water use and watch their monthly bills decrease after replacing turf with desert plants or upgrading fixtures. In 2014, the Associated Press reported that California communities without water meters used more water per person each day than the state average. The authors of a 1923 Tucson water management report knew this nearly 100 years ago. They encouraged the city to quickly finish the job of installing water meters because, “A metered customer pays for exactly what he uses and he will take particular pains to avoid wasting water and will give immediate attention to leaks.” Exactly, how do you manage what you don’t measure?